Silver Creek homes for sale in North Las Vegas offers large home sites up to one half acre of land. Silver Creek real estate consists of 20 residences with pool sized backyards and space on the side of the home for boat or RV parking. Standard features include 42-inch maple cabinetry accented by crown molding, upgraded slab granite kitchen countertops, upgraded flooring upgraded and stainless steel appliances with refrigerator. The two story residences range from 4,401 to 5,000 square feet, with up to five bedrooms, 4 1/2 baths and up to four car garages. Prices for the new residences by Lennar start in the mid $500,000s. A new washer and dryer is included at no additional cost. The Thousand Oaks floor plan with five bedrooms, three full baths, measures 4,500 square feet and a three-car garage. The kitchen features a bar-counter seating around a work island with and an informal dining area, which opens up to the covered patio. The main-floor includes a bedroom and bath, and a formal living room with a formal dining room and high ceilings. The master bedroom suite included two separate walk-in closets and a master bath with a vanity and separate sinks. There is a fireplace in the adjoining great room. A loft on the second floor opens to the floor plan’s front elevation porch. The master bedroom retreat includes a two-sided fireplace which is placed over the oval garden tub. The Morro Bay plan offers five bedrooms, 4 1/2 baths, 4,486 square feet and a four car garage. The formal living room showcases a 19-foot ceilings and a formal dining room accented by columns and a decorative archway. 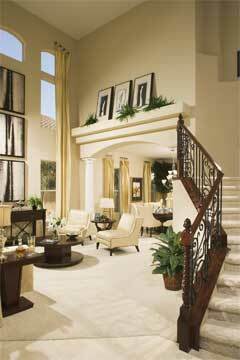 The formal foyer has an owner’s study. The kitchen cuts the living areas and opens into a family room. The curved work island in the kitchen includes a walk-in pantry, counter seating, and informal dining nook with bay windows. The main floor also includes a full bedroom and bath, guest powder room and a laundry room. The master suite is located on most of the second floor. Silver Creek homes in North Las Vegas real estate are currently available for immediate to 60-day move ins. Call 702-505-6988 for VIP Las Vegas luxury homes buyer or seller representation by a Las Vegas real estate agent. Silver Creek homes for sale in North Las Vegas offers pool sized lots.